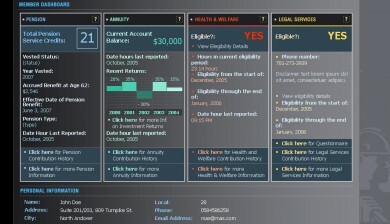 Organizations with unique information and stakeholders often find the need to communicate specific information to particular groups securely. Polar Design’s 8 years experience in portal design and extranet development includes Insurance and Taft-Hartley Fund clients – our solutions increase quality of customer service, marketing, and online communications. With our well established processes, and diverse development team, Polar Design can produce a custom portal or extranet that is scalable, secure, and that delivers information in an attractive manner through smart layout, attractive design, and unique functionality like dashboards or interactive charts. When integration of your portal or extranet with third party systems is a must, Polar Design is a great choice with our experience integrating via Web Services (.NET or XML Soap), flat file and other methods to ERP, e-learning, inventory, benefits administration and other systems. We draw our greatest advantage with having branding, design and marketing specialists working side by side with our developers, allowing us to bring a holistic view to any project. A full time software architect / project manager with systems analysis experience, and coders with Windows and Linux experience provide necessary specialization and quality control.